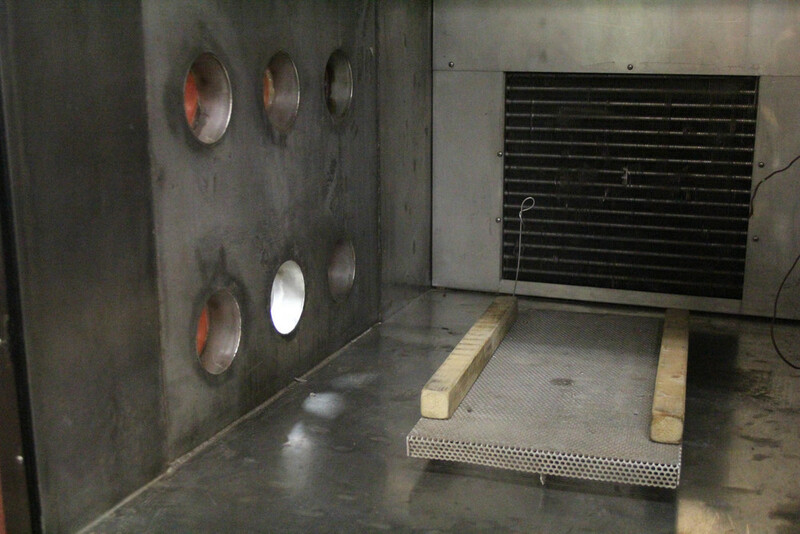 Testing chambers suited to a variety of environmental simulations are used by NU Labs to conduct nearly every climatic test for commercial and military specifications. Of the many test chambers available at the lab, the largest provides 1400 cubic feet of work space and temperature variations from extreme heat to arctic cold. With a 10’x10’x14’ temperature humidity chamber, large test articles, like these Laser Guided Training Rounds (LGTR) recently tested for Lockheed Martin Tactical Defense Systems are no problem. Several chambers are capable of rapid temperature transitions while other chambers combine temperature variation with a variety of humidity, temperature, atmospheric or altitude conditions. Vibration can also be induced in at least half of the lab's testing chambers for true combined temperature/humidity/vibration environment testing. All of our chambers can also be equipped to simulate solar effects. For testing the effect of salt water corrosion on marine equipment, the lab contains a salt spray chamber in which accelerated simulations can be produced at varying temperature and salinity levels. We also provide complete enclosure testing that tests for spraytight, watertight, dripproof, immersion, and wind and rain conditions. Testing at Altitude and Temperature. Altitude Range - 100,000 ft. Testing conducted to determine the operational and/or the actinic effects of solar radiation on equipment that may be exposed to sunshine during use and operation, or unsheltered storage. Face size to 4 ft. by 8 ft. Testing conducted to determine if exposed equipment, or portions thereof, can operate within performance limits in high wind velocities and simulated hurricane conditions. Maximum Velocity: 100 mph wind measured at 10 feet. 35.9 ft³, -70°C to +177°C, -1,500 - 100,000 ft.